Ethereum has nearly doubled from its low of under $80 at the end of 2018. Still, it's a far way from its all-time high near $1,500 and resistance is prevalent on the way up for the coin. The price is still held back by the tech that has inherent risks and little real-life adoption. It will need this to push past bearish signs. The Ethereum community focus has shifted to the recent 51% attack on Ethereum Classic, the original chain of Ethereum that the ETH asset and chain "hard forked" from. This doesn't have any immediate affect on ETH price except for investor confidence at this still new technology and the ability of a force to essentially "take over" the chain through mining power. Risks like this, combined with the increasing difficulty of mining and the environmental and energy consumption factor, give all the more reason for the Ethereum development team to continue its focus on "staking"—rewarding ETH holders instead of miners for maintaining the legitimacy of the network. 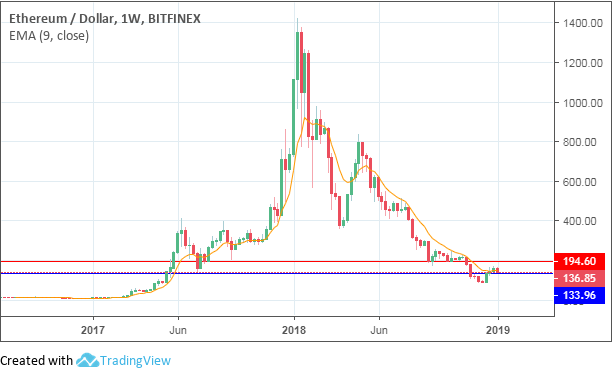 Price has begun to dip once more on the back of some profit taking from those who bought into the December 2018 lows. 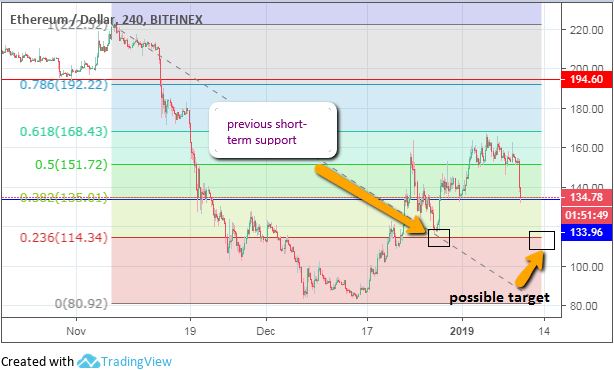 With price now at $136.85, it's expected that a test of the long-term support at $133.96 will occur within the next three days. Well, the crypto craze may have deflated. But that's not a bad thing! In fact, if you still believe in the transformative power of blockchain, it means that many of these technologies are back to early adopter prices. At the Coin Agora, our focus is on altcoins - the smaller cap cryptos that have massive potential to disrupt business ecosystems. Don't miss out—the price craze may return in 2019 and it's your chance to get in now. Let us help you cut through the noise and find winners - join the Coin Agora community today!